Heyn Photo, Photographer. Omaha. Library of Congress, Prints and Photographs Division. Control #2008675510. There are many many striking photographs of Native Americans, this one of a chief and a portrait, taken at the turn-of-the-century. 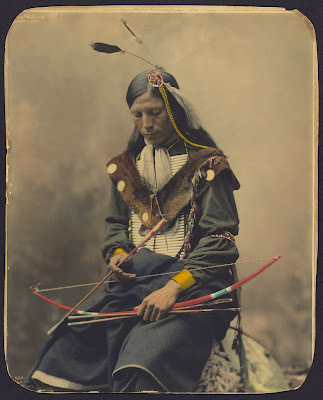 The treatment of Native Americans as photographic subjects, particularly as in a case with a tribe still not fully assimilated, is strikingly different from most African American portraits. This one is also beautifully colored.